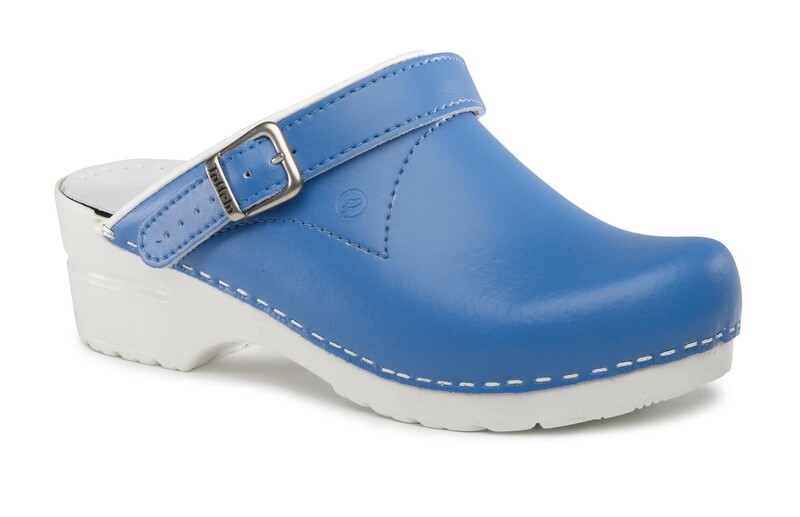 Toffeln Flexi Clog, for use by healtcare professionals. The FlexiClog, with its superior ergonomic shape, supports the natural posture of the body. Enjoy the leather insole padding and spread your toes comfortably in the spaciously designed toe box. The FlexiClog has a shock absorbing heel and comes with fully flexible soles with an adjustable heel strap. The elastic section of the heel strap prevents any pinching or squeezing while your walking. All these wonderful features make the FlexiClog an outstanding shoe for long workdays. The antistatic soles reduces the risk of slipping. It also helps protect against cross contamination or damaging electronic equipment due to static shock. Recent studies have pointed out that elimination of static energy can also reduce stress in the human body.